In Fall 2017, UNCG elected to implement the Curriculum Inventory Management (CIM) and Catalog (CAT) modules of the CourseLeaf system produced by Leepfrog. CIM and CAT are replacing the existing paper-based processes for proposing, reviewing, and approving changes to courses and programs and the annual production of the University Catalog (formerly the undergraduate and graduate bulletins). The CIM module enables the online submission, editing, tracking, and approval of new and existing courses and programs, and the CAT module addCAT provides the capability to manage the editing and publishing of catalog content to web, mobile, and print (PDF) platforms. An integrated, web-based system, CourseLeaf’s CIM and CAT modules, will significantly enhance UNCG’s curriculum and catalog by providing faculty and staff with a more efficient, accurate, and accessible means of managing the university’s curriculum. CIM End Users: During this small-group session, the trainer will demonstrate how to make edits to courses and programs in CIM. This is a hands-on session and attendees may follow along with the trainer, using the software as part of the learning process. Participants are also encouraged to bring course and program proposals that they may be working on. Attendees: All faculty who will author course and program proposals in CIM should attend one of these sessions. CIM Approvers: This large group session will instruct those who have an approval role in the curriculum process about how to accomplish their tasks in CIM. The trainer will provide an overview of the CIM module, review the workflow and approval process, and give a brief presentation on the editing tools. Attendees: Faculty who are responsible for approving course and program proposals (e.g. Department Head/Chairs, Associate Deans, Curriculum Committee Chairs) should attend one of these sessions. CAT Page Owners: In this session, the trainer will provide an overview of the CAT module and demonstrate how to make edits to non-curricular content on catalog pages. This is a hands-on session, and attendees may follow along with the trainer, using the software as part of the learning process. Participants are also encouraged to bring edits they are working on for the 2019-2020 catalog edition to the session. Attendees: Department and college/school staff or faculty who have been designated as catalog content/page manager or owners should attend one of these sessions. The sessions will not be in a lab and a laptop is required. ITS will provide a limited number of laptops by request. Please register for sessions at your earliest convenience at workshops.uncg.edu. The implementation of CourseLeaf CIM and CAT is an exciting initiative that provides UNCG with a system that will enhance our ability to manage our curriculum and catalog. I encourage all faculty and staff to take advantage of the upcoming on-campus training to learn about how to utilize the capabilities of this new system. Please visit provost.uncg.edu/coursleaf/ (available January 18th) for additional information on the implementation and the training. Questions may be directed to Kristine Sunda, Executive Director of the Integrated Futures Team. Dr. Carl Mattacola has accepted the position as Dean of the School of Health and Human Sciences and will begin his new role on June 1, 2019. To view full announcement please click here. In November, UNCG named the second cohort of McNair scholars, and 19 students were inducted into the UNCG Ronald E. McNair Postbaccalaureate Program, a federal TRiO program funded by the U.S. Department of Education. The new cohort includes representation from every school at UNCG and 17 departments. The goal of UNCG-McNair is to diversify faculty demographics across the nation by providing experience and training to students typically under-represented in the academy. Designed to prepare undergraduate students for doctoral studies, UNCG-McNair includes a wide variety of guided research opportunities, including a special interdisciplinary research methodology course, direct mentorship from research librarians, and the UNCG-McNair Summer Research Institute. As part of the Institute, the McNair scholars visited Washington, D.C., where they conducted research at the Library of Congress. The research opportunities have not only given the McNair scholars access to the world of academia, but also a research community among their peers. Senior McNair scholar McKayla Bohannon giving the keynote address at the induction ceremony. 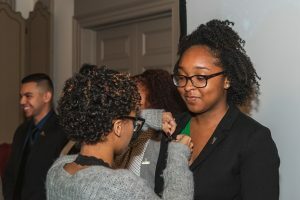 Junior McNair scholar Asia Brannon pinning new McNair Scholar Antoiné Cunningham as a recognition of her membership. 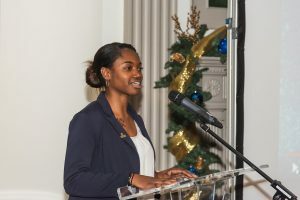 “The McNair Scholars program has given mea community to belong to that I will be a part of for life,” said senior psychology major Ariana Watkins. “My mentors have been wonderful and have really helped me a lot. I almost didn’t apply for the program because I didn’t think I was good enough, but this program has taught me that I am good enough.” Watkins plans to pursue graduate study focused on wrongful convictions and jury decisions. Watkins’ faculty mentor, Associate Professor in Psychology Gabriela Stein admired her mentee’s ability to develop a rigorous methodology and include real-world applicability in her research. “Our meetings were lively, fun, and engaging,” said Stein. “Watching Ariana develop as a scientist as she has refined her methodology and questions based on her initial pilot results has been inspiring.” The McNair Scholars program aligns with one of Stein’s main goals as a researcher and educator, which is to diversify science. 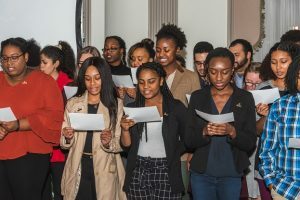 “Because diversity strengthens psychological science, as a mentor, I endeavor to foster scientific self-efficacy in all my students so that they can significantly contribute to our field,” she said. Several McNair scholars presented their research at national conferences during the fall, and more than half of the scholars are applying to graduate programs. Alyssa Sanchez has been accepted to the UNC Chapel Hill School of Pharmacy and Nicholas Smurthwaite is enrolled in the accelerated MA program in the English department at UNCG. The scholars reciting the McNair Pledge. 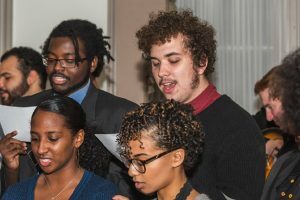 “After a very exciting first year, UNCG-McNair is looking to build on the lessons learned and push forward in helping students succeed in conducting research and gaining admissions to graduate school,” said associate director of the program, D. Clinton Williams. I will strive to honor and respect the legacy set forth by Dr. Ronald E. McNair and former McNair scholars. I will work earnestly toward the realization of my educational goals. I embrace the challenge of attaining baccalaureate and post baccalaureate education through hard work and perseverance. I strive to overcome any obstacles that might hinder my educational attainment. I will observe high ethical, moral and academic standards. I understand that I must be trustworthy, honorable and noble. I commit myself to excellence, scholarship, and service. I am a McNair Scholar! With this pledge, I hereby accept the responsibilities and privileges of induction into the Ronald E. McNair Postbaccalaureate Achievement Program. Dr. Sherine Obare has accepted the position as Dean of the Joint School of Nanoscience and Nanoengineering and will begin her position on January 14, 2019. UNC Greensboro’s Lloyd International Honors College was well represented at the North Carolina Honors Association (NCHA) 2018 conference, held at High Point University in late September. The Honors College has played a leadership role in the statewide association over the past three years, hosting the conference in 2016 and continuing to host the NCHA’s website. 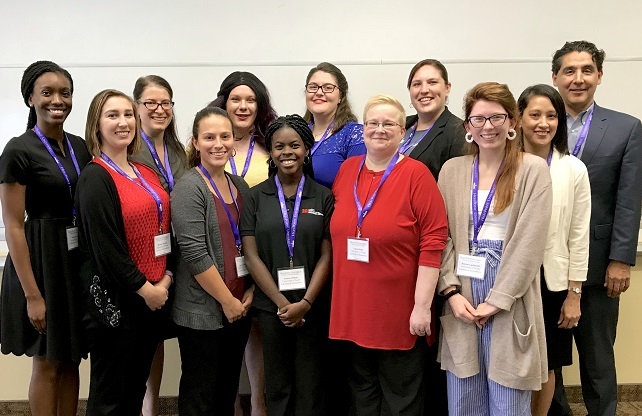 This year’s conference theme “Conversations that Matter” was well suited for Lloyd International Honors College’s dynamic students, whose presentations highlighted research in education and experiential learning. Those presentations included: “The Importance of Early Language Acquisition in Deaf Children: Sign Language and Education,” by Lauren Szalay and Brooke Rockot, and “Studying Abroad and Its Impact on My College Experience,” by Sarah Maske. Additionally, “A Never-ending Quest: Tracking and Evaluating Student Engagement and Outcomes,” was presented by Honors staff members Portia Harris, Maria Hayden, Angela Bolte, Julie Boyer and Rebecca Munich. For more information about the Lloyd International Honors College, visit the website here. Whether it’s being a first-generation college student, overcoming language barriers or facing other challenges, many young people in the Latino and Hispanic community find understanding the process of applying for financial resources and gaining admission to college a daunting prospect. Prospective students already have plenty of questions. How do I apply? What resources are available to me? What will I major in? What’s life like on campus? Many of these questions require more than your typical college fair to become informed. To meet this need, the Division of Enrollment Management’s CHANCE program provides Latino and Hispanic students the opportunity to engage in an intensive, five-day college preparatory immersion experience. 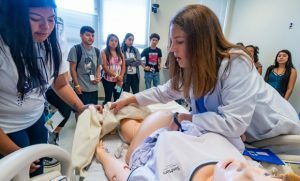 The summer program exposes students to classroom experiences, leadership development, course registration, campus organizations, workshops, panel discussions and a college residence experience. 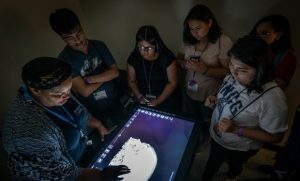 Students experiment with the School of Nursing’s anatomy visualization table. 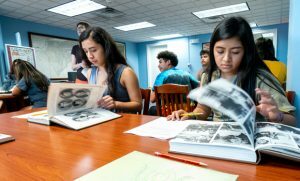 When the program first started in 2017, UNC Greensboro welcomed 61 Latino and Hispanic high-school students for three days. The camp was such a success that attendance nearly doubled, to 111, and the duration was extended to five days for the 2018 CHANCE. Cervantes, an elementary education major with a focus on dual language, was one of 24 UNCG student mentors in 2018, 23 of whom were Latino or Hispanic. Students explore UNCG’s history in University Archives. According to volunteers, the expansion of programming and the depth and breadth of the program will have an incredible impact on Latino and Hispanic youths. Miguel Angel Cruz-Morales, a junior nutrition major, said the program’s special attention to Latino culture is especially important. Clinical Instructor, Lori Hubbard, leads a labor and delivery simulation with the School of Nursing’s SimMom during a mock nursing class for CHANCE students. CHANCE is funded by the Bill and Melinda Gates Foundation as part of the Frontier Set initiative. As one of 31 Frontier Set schools, UNCG was selected to further a number of initiatives focused on identifying successful strategies to improve graduation rates, especially for low-income and first-generation students and students of color. In addition, the program has garnered University-wide support from faculty and staff in each academic and student support unit. CHANCE is the only program of its kind in the state, and has received more than 250 applications from the mountains of North Carolina to the coast. To learn more, visit enroll.uncg.edu/uncg-chance. Featured Image: UNCG Volunteers and CHANCE students take a tour of the UNCG wetlands. I’m writing to inform you that Faculty and Staff Awards will be presented in separate ceremonies this year. The Faculty Award Ceremony will take place on Wednesday, April 17th at 4pm in the EUC Auditorium. The previously scheduled General Faculty Meeting will now begin at 2pm in the EUC Auditorium. A reception will be held in the Alumni House, Virginia Dare Room immediately after the awards ceremony. Please note that the Celebration of Faculty Excellence in Research and Creative Activity reception will coincide with the Faculty Awards reception. Please remove the April 16th Celebration of Faculty Excellence in Research and Creative Activity event from your calendar. A committee has been constituted to plan this restructured event. As their work progresses we will communicate more information on this reorganized ceremony. The Dean of Health and Human Sciences Search Committee and the Provost recently held confidential in-person interviews with semi-finalists for the position and selected four finalists to visit campus. I encourage you to participate in the interview process by attending the open forums and receptions. The finalists will provide a 15-20 minute presentation on challenges and opportunities facing Schools of Health and Human Sciences, particularly UNC Greensboro, followed by a question and answer session. Candidate 1: Monday, October 22nd 2:15-3:30pm, EUC Alexander Room, reception to follow in EUC Claxton Room. Please join me in welcoming Dr. Samantha Raynor to the Office of the Provost. In her new role as Assistant Vice Provost for Student Success Initiatives, Samantha will have continued responsibility as the Co-PI and Site Coordinator for the Gates Foundation funded Frontier Set Initiatives and will assume responsibility for a new grant funded project supported by the Edward M. Armfield, Sr. Foundation, Inc. This project involves the development and implementation of an academic success coaching program for first year students. Samantha will also serve as the point of contact for the newly formed APLU Student Success Transformation Cluster Initiative. She will also have responsibility for the development, pilot, assessment and scaling of future undergraduate student success initiatives. Samantha came to UNC Greensboro in February as the Senior Director for Student Success Initiatives in the Division of Enrollment Management. No stranger to UNCG, Samantha previously served as the Director for Special Projects and Strategic Assessment in Academic Affairs at the UNC System Office. In this role she worked closely with the constituent institutions to develop and implement various student success strategies. One of those was the Adult Learner Initiative (also known as part-way home) which had an associated State appropriation of $2.3 million. Dr. Raynor completed her doctoral work at The George Washington University in Higher Education Administration, her Masters in English Literature at East Carolina University and her Bachelor’s at North Carolina Wesleyan College.